ColonialTemps is the internal temporary employment service at GW and is a dedicated venue for GW schools and departments to hire temporary staff. ColonialTemps has many benefits for both managers and staff. GW schools and divisions can take advantage of a staffing service that understands the needs of your department and the university while avoiding administrative fees incurred by using an outside agency. ColonialTemps staff can enjoy of many of the resources available to GW employees while gaining valuable job experience. Below, prospective ColonialTemps can learn more about the program and how to apply. Current ColonialTemps can find information on requirements for starting their assignments and the various resources available to them. GW managers can view resources for hiring and information on ColonialTemp assignments. ColonialTemps assignments are diverse in scope and can last from one day to many months. Assignments become available for a variety of reasons: a department may need to supplement their existing staff or require coverage for an employee that has taken a temporary leave of absence or vacated their position permanently. Assignments also vary in their respective job duties and requirements. ColonialTemps are placed in a variety of roles within departments throughout GW: administrative, financial and accounting, writing and editing, coordinating, student advising, marketing, information technology, and many others. Some departments may provide on-the-job training, while others may require that an applicant display a certain level of skill and experience in order to be considered. ColonialTemps assignments may be located at any of GW’s campuses and locations throughout DC and the surrounding area, including the Foggy Bottom and Mt. Vernon campuses within DC; locations in Ashburn, Arlington, and Alexandria, VA; and Rockville, MD. Understand the work environment at GW and gain experience that may be beneficial as you apply for permanent positions at the university. Work for a nationally recognized institution of higher education. Network with members of GW’s diverse community. After that, you will have access to several university systems such as the GWeb Information System (which allows you access your pay and employee information), the time reporting system, the my.gwu portal, and more. In addition to systems access, you will have access to a variety of benefits available to GW employees, such as our work-life and wellness benefits. Please read information on completing the I-9 and other tax forms. Section 1 of the I-9 can be completed online and must be completed on or before your first day of work. Section 2 must be completed in person prior to or within three days of the start of your employment. You will need to bring the proper forms of identification with you in order to complete section 2 of I-9. Your GWorld card will serve as your identification card and will grant you access to various facilities within the university. Before or during your first assignment, visit the GWorld Card Center to obtain a GWorld Card. The GWorld Center is located both on GW’s Foggy Bottom campus (Marvin Center, 800 21st Street NW - Ground Floor, Washington, DC 20052) and on GW’s Ashburn, VA campus (Enterprise Hall, 44983 Knoll Square - Main Security Desk, Ashburn, VA 20147). It is recommended that you enroll in direct deposit both for security and convenience. You may enroll in direct deposit electronically via the GWeb Information System or in person when you complete your I-9. The GWeb Information System allows employees, including ColonialTemps, to review and edit their employee and personal information. Once you have accepted an assignment and have been assigned a GWID, you will be able to access GWeb. GWeb can also be accessed via the myGW portal. Accurately recording your work time is essential. The university’s Time Reporting System (TRS) is used to collect, manage, and report arrival and departure times. Instructions for using the TRS are available on GW’s Payroll website. Below are a number of resources that you may find helpful during your assignments at GW. Known as myGW, this site is your electronic gateway to information at GW, including the GW employee directory as well as access to GW email and calendars. Be sure to login regularly. You can customize the web links so that information you need frequently is displayed when you log on. Access the pay schedule for the current fiscal year. Visit this site for important information about the identification and reporting of activities and transactions that may be violations of laws, regulations, or university policies and procedures. The Compliance Awareness Guide, Central Policy Web-Page, and Regulatory Compliance Help and Referral Line are important tools in promoting compliance. Compliance is everyone’s responsibility. Talent @GW: Talent @GW, GW's learning management system, allows you to access many professional development training tools, including course on Lynda.com as well as tools for having successful relationships with your managers and colleagues. The GWPD website has information on campus safety, lost and found, lost GWorld cards, and other services. In addition to providing information as to university operating status during weather and other events, the Campus Advisories page keeps you up-to-date on operational statuses for both regional and campus transportation systems. GW offers free shuttles to help you efficiently travel between campuses, including the Foggy Bottom, Mt. Vernon, and the Virginia Science and Technology campuses. The George Washington University has a fascinating history, steeped in the unique culture of our nation’s capital. Below are a few of the many resources available to you both online and on campus to get to know our dynamic university community. Learn what values serve as guiding forces for the GW community. This section of the GW Employee Handbook provides you with information about some of the resources on and around campus. This self-guided tour will give you information about the campus and its history. 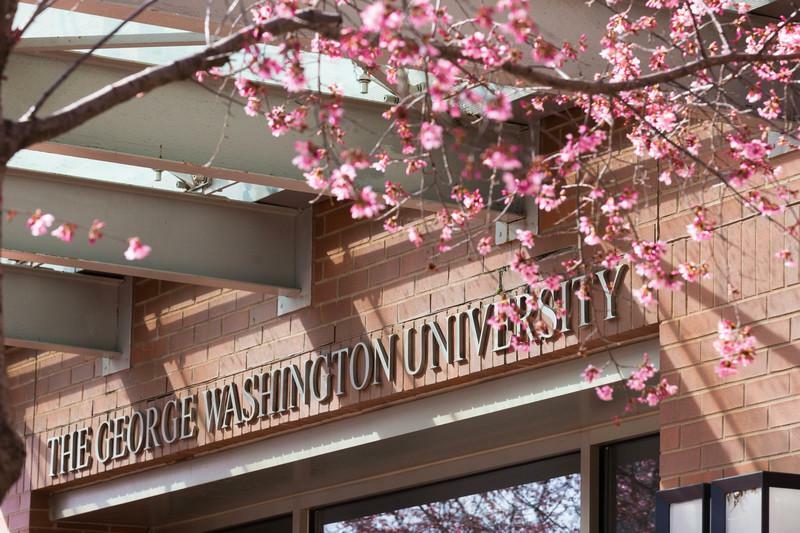 Explore the many events and activities at GW. The GW calendar system features a variety of search and filter features to help match events with your interests. GW sponsors and hosts many interesting, dynamic exhibits and performances throughout the year on campus and in the surrounding areas. Follow the different Colonials sports teams. Fitness & Recreation Programs: Whether it’s participating in one of the free fitness classes available to GW employees or any of a number of other programs, GW has a fitness option for everyone. Smoking Cessation Program: GW has partnered with Alere Wellbeing to offer free telephonic coaching and up to eight weeks of over-the-counter nicotine replacement therapy (patch or gum) at no cost to you. Learn about GW's Smoke Free Policy. Positive Vibes: A free and easy way for GW employees to publicly thank, congratulate, or recognize their colleagues. Submit a positive vibe or read current positive vibes on the Work Fulfillment page. ColonialTemps partners with departments at GW to fulfill their temporary staffing needs. We take pride in providing you with friendly, reliable service to make sure that your staffing needs are met. We help you through every step of the process and check in with you once your assignment is filled to ensure you are satisfied. We will work with you to understand your staffing needs and will provide you with effective, timely results. Our knowledge of GW specifically and recruiting generally allows us to ensure your needs are met while maintaining regulatory compliance. From the moment you contact us, we make your needs our priority. A prescreened pool of candidates: candidates are screened and vetted prior to placement. Employees knowledgeable about GW: many ColonialTemps have formerly worked for or studied at GW. Improved compliance process: As part of GW’s HRMD department, ColonialTemps monitors changes in and updates to DC temporary employment laws in order to ensure compliance. Quality assurance: regular check-ins with both temporary employees and supervising managers to make sure that you are getting the best possible service. ColonialTemps has filled a wide variety of temporary positions over the years. We have placed writers, administrative assistants, finance managers, scanners, customer service representatives, help desk analysts, just to name a few. ColonialTemps can provide you with staff for an assignment lasting only a few hours to those lasting many months. How soon will the department need the employee to start? How long is the assignment anticipated to last? What are the scope and responsibilities of the role? What will be the weekly schedule? What pay range do you have in mind? Would you like to request a phone or in-person interview? Why is the assignment available? 2. Once you have gathered as much information as possible about the assignment, fill out a ColonialTemps Request Form (PDF) and email the completed form to ColonialTemps ([email protected]) at your earliest convenience. 3. ColonialTemps will provide you with candidates that best match the requirements of the position. 4. Upon request, ColonialTemps will assist with scheduling interviews. 5. Once a selection has been made, ColonialTemps will provide the Offer Letter, GWID, NetID, start date and time, and other pertinent information regarding the assignment directly to the ColonialTemp. 6. Communicate any changes in assignment responsibilities and duration with ColonialTemps staff while the ColonialTemp is on assignment. Extensions may be requested upon approval from your Finance Director.